The Ukrainian Parliament has approved new regulations on martial law, which among other things allows for extrajudicial detention and relocation of Russian citizens in the country. The law was approved by 254 deputies out of 322. It regulates how martial law can be declared in Ukraine and the changes to legal procedures it brings. These changes include "forced relocation of the citizens of a foreign country who threaten or undertake aggression towards Ukraine," the law's memorandum states as cited by TASS. The parliament declared Russia an aggressor on January 27 by adopting a declaration to that end. Apart from the relocation of foreign citizens, martial law will allow Ukrainian authorities to confiscate private property, regulate mass media, prohibit any rallies, marches and other mass gatherings and initiate the legal process of banning any political party or mass media deemed "acting against Ukraine's independence." It also entails labor conscription for all able-bodied Ukrainians not currently in the army and a possible curfew. In areas of actual fighting, the role of local authorities is passed on to the military command. This is the new version of the law, which was preliminarily approved on April 9. 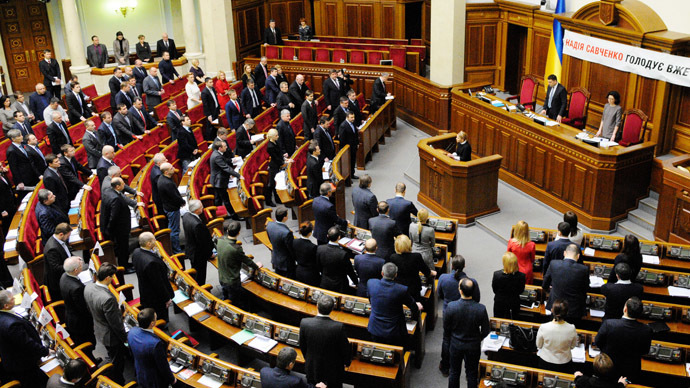 For martial law to take hold, the parliament has to approve a corresponding ruling by the Ukrainian president. It can be declared in the whole country or selected regions.